Stumped for the perfect holiday gift? 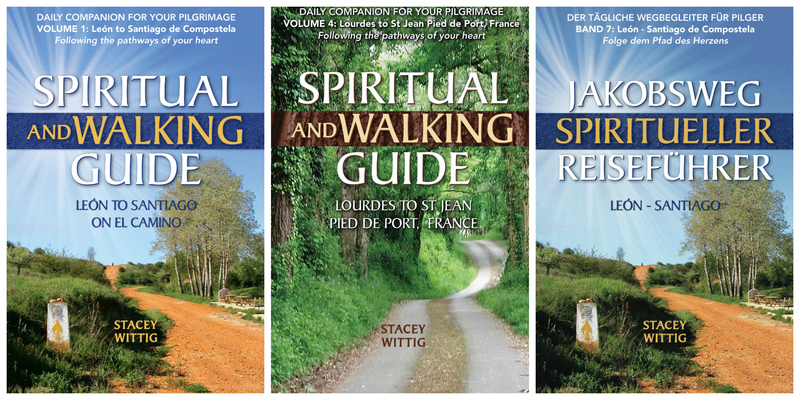 Here’s the perfect present for the Camino pilgrim on your list: Spiritual & Walking Guide: Leon to Santiago. A book for the future pilgrim, the seasoned pilgrim or the armchair pilgrim. Happy New Year! I’m looking forward to walking and writing about the Camino de Santiago in 2018. I was honored to see my Camino book, Spiritual and Walking Guide: León to Santiago in the book showcase at Albergue Santa María de Carbajal “Benedictinas Carbajalas” during their New Years dinner in León, Spain. The Christian daily devotional is available for sale at the Benedictine monastery’s albergue in León, Spain. And on Amazon.com Happy New Year! Stacey Wittig is an Arizona travel writer based in Flagstaff, AZ. She writes about pilgrimage and Camino de Santiago. AmigosNAZ is a print and online media source that provides information about and for the vibrant and diverse cultures in Northern Arizona. The American Pilgrims on the Camino (APOC) recently published an excerpt from “Spiritual and Walking Guide: Leon to Santiago on El Camino” in their summer newsletter. American Pilgrims on the Camino, a non-profit organization whose objective is to facilitate communication within the community of North American pilgrims, has over 22 local chapter and reaches 1000s of readers. The daily Camino devotional complete with questions for reflection may be viewed at: Spiritual-Guide-Stacey-Wittig-APOC-newsletter_1407. El Camino de Santiago in Spain is a popular trekking route for North Americans since the movie The Way, starring Martin Sheen and produced by his son Emilio Estevez. In only 1 minute, 49 seconds you’ll learn all about the book entitled “Spiritual Walking Guide: León to Santiago on El Camino” by Stacey Wittig. The guidebook is available in paperback from Amazon.com and other retail outlets, and is available for Kindle and other devices at www.amazon.com/author/staceywittig.